After spending two days in Moore, Oklahoma and returning to Enid late last night, I caught up on some email correspondence and social media this morning. I mentioned in an earlier post being surprised by a tweet from John Piper that seemed calloused toward the suffering of the victims of the Moore tornado. Today, a Facebook friend linked to a post from Doug Wilson, praising Doug for taking Rachel Evans to task for challenging John Piper's theology of God's sovereignty. Those who know me would tell you I have more in common with John Piper than I do Rachel Evans. However, it seems to me John Piper and Doug Wilson have a great deal to learn from people like Rachel Evans. Rachel is a person who relates to an individual in the midst of suffering. Doug Wilson and John Piper are theologians who wish to teach an individual in the midst of suffering. What Doug and John can learn from Rachel is this: People don't care what you know until they know that you care. Jesus first gave a cup of cold water and accepted the woman at the well where she was before He ever addressed any confusion in her theology. John Piper and Doug Wilson don't have a theological problem, they have a relational one. They summarize all tragedies, including the Moore tornado, like this: "If disaster befalls a city, it is from the hand of God" (Amos 3:6). They see cities, not people. Of course, Doug Wilson and John Piper express a concern for people in their writings. Doug writes, "The sovereignty of God is a hard shell case that carries and protects the tender heart." Doug is unintentionally miscommunicating what he believes. It is a fact that sometimes tender hearts are broken, and those broken hearts do not fall outside of God's sovereignty. Doug means to write, "Belief in the doctrine of the sovereignty of God is a hard shell case that carries and protects the tender heart." I happen to agree with Doug's message, but I greatly disagree with Doug's methodology. You don't shout at a city that a tornado is a display of God's holiness, majesty and justice in order to protect the tender heart of an individual; you sit down with that individual who lost his or her home (or loved ones) and show compassion and mercy and then you help them restore what was lost. After you show them mercy, you then have earned the right to teach them how God will work all things for good to those who trust Him. I guess I'm saying one of the wisest things a theologian can do in the midst of tragedy is to shut up his teaching until he shows up in mercy. You don't change someone's theology until you connect with them relationally. Calvinists need to start seeing people, not cities. I have never met John Piper, Doug Wilson or Rachel Evans. I know all three through their writings. All three have a great deal to offer the body of Christ. Rachel maybe can learn some theology from John and Doug, but I'm of the opinion its more important that these two men learn something relationally from Rachel. Postscript: Since I posted the above this morning, I was made aware that John Piper acknowledged taking his tweet down and that he gave an explanation for why he did. He writes: "The reason I pulled my tweets from Job is that it became clear that what I feel as comfort was not affecting others the same.” Maybe this post will help explain to him why. I have a way of thinking about suffering in theological or cosmic terms. I think it's OK to have some sort of "explanation" for suffering in general. But there is no explanation for specific suffering. Why did this particular thing happen to you or me? There is no reason that can help, only compassion. Good post, Wade. Thanks for the assistance you and your church were able to provide to the people of Moore. My church (Mayflower UCC) and many other groups and individuals have done a lot of good. But it is still a terrible time. Dr. Levi Price, former professor of Pastoral Ministry at Truett Seminary, use to tell us that a funeral is not the place to correct a person's theology. That's what I hear you saying in this post. Thank you for your comment and the work of your church. A hearty amen to Dr. Price's quote. Yesterday I was upset with you for including the Piper Tweet in a blog that otherwise was very good about how God's family in Oklahoma and beyond is responding in such a positive way. The outpouring of love and support by the church for the victims of the Moore tornado has been a wonderful example of God's goodness. The Piper tweet seemed (to me) to mar that accounting of what you saw, heard, and experienced. I wish you had just left it for a separate post. Anyway, I really liked the perspective you gave on the consequent 'controversy' that has arisen from the Piper Tweet and Rachel Held Evans' response. It goes along with what we use as our strategy for planting churches -- Luke 10. When Jesus sent out the 70 he basically told them: Pray (for workers), go out, leave your personal 'stuff' behind, stay focused on the task, find the man of peace, stay at his house, eat with him, drink with him, heal those who are sick, and then, when you have done all that, THEN you can tell him about the Kingdom of God. (that would be MY version of Luke 10!). Hearing and responding to the truth is easier and more effective if people have first seen the truth played out in the lives of God's family. 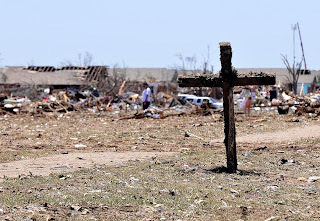 It was a blessing to me to read your report of how the church in Oklahoma and in the rest of the USA is expressing God's love through this difficult time in the lives of so many that were affected by this storm. I received the tweet while walking among the devastation, after having spent about ten minutes with an elderly woman who could not stop crying at the loss of her grandchild, home and work place. It struck me as odd and became part of the experience for me. Just as my writing about it marred my accounting of the day for you, the tweet marred my actual experience of the day. Thanks for your comment. Brother, I have a number of issues with your posts. Not as a Piper defender but as a Christian brother. First, why did you post one of Piper's tweet and not both. I have read from sources that Piper tweeted not only Job 1:19 but Job 1:20 at the same time. So for you to only cite Job 1:19 in your post and not Job 1:20 is not truly dealing with Piper in context and is intentionally misleading, unless Piper did not tweet both at the same time. Secondly, you assume that your understanding of what people need in the time of tragedy must be the right response. You write, "People who have lost loved ones to death during a great wind don't need theologians to quote Scripture about people dying in a great wind. They need our love." Well it may surprise you but some people appreciate the quoting of Scripture in the time of tragedy even from someone who has not relationship with them. They appreciate the trust and comfort that the word of God provides more than words or even actions of sentimentality. They appreciate being directed to the faithfulness of God which they see in His word. So they continue to trust, lean on, and worship Him even in the midst of their suffering. I could be wrong but I believe this was Piper's point or close to it in quoting verse 20. Thirdly,you set up this tired straw man of love and theology in opposition. As though Piper was more concerned about theology than he was about love. Let's love people with the truth. Faulty theology is not love. Its easy for people like Rachel Evans, who you praise for her relational skills, to be relational when you relate to people from flawed, faulty theology. They say what the peoples' ears want to ear. No different from Joel Osteen and his relational capabilities. Furthermore, you go on to talk about what people can learn from Evans, interesting you recommend such a person to learn from with her distorted dangerous Christian views. Even she had to tone down her rhetoric and apologize to her followers in another post following her comments. Finally brother, you make this great error that in order to proclaim the truth of God that the Christian must first earn a right to proclaim the truth of God. God has given the mandate. So I do not have to feed the 5000 or the one homeless man before I proclaim the gospel to them. You state: "You don't change someone's theology until you connect with them relationally." It seems you are trusting relationships more than you are the power of the word. What Doug and John can learn from Rachel is this: People don't care what you know until they know that you care. Otherwise, you're just another Party Commissar reciting The Party Line to the masses. Piper doesn't understand God as 'paraclete' in the Person of the Holy Spirit . . .
As far as Doug Wilson goes . . . is he at all credible, considering where he comes from with his history? I hope not. For the sake of the witness of the Church, I hope not. My preference would be that you refrain from calling me brother if at all possible. (1). I only saw one tweet, not two. (2). Second, you are correct - I could be wrong in the premise of my post - which you obviously believe. Ironically, someone might ask you the same question you ask me. (3). I agree. Be full of love and truth, grace and truth, mercy and truth. (4). I already said I have more in common with John Piper than Rachel Evans, but that does not negate me being able to learn from Rachel Evans, does it? (5). "So I do not have to feed the 5000 or the one homeless man before I proclaim the gospel to them ... It seems you are trusting relationships more than you are the power of the word." I am delighted to know you understand the point of this post. It seems Mr. Burleson that you take it very lightly that you have taken a Christian out of context and misrepresented. Furthermore, it is truly disappointing to see that you are not willing to take accountability for your comments. Now, I expect many who make the snide comments about Piper statements to not truly understand the implications of their words, which still in no way excuses them; however to see this lack of discernment on your part is surprising. You are clearly in the wrong and if you are Christian I would expect by now you realize that you are wrong. Instead of giving these commenters more red meat to eat, namely the misrepresentation of Piper, why don't you do the Christian thing and apologize formally to Piper. As to you question regarding Rachel Evans, why would I direct anyone to someone like Evans who clearly distorts, contradict, and misrepresent the Bible. To ask can I learn something from her, is to similarly ask can I learn from a Jehovah's Witness, Muslim, or Mormon. Whatever is coming from them or Evans is not trustworthy or recommended. It is truly sad to see that you would even make a comparison between learning from her and learning from Piper. What a sad day, when pastors start recommending and highlighting the value of Rachel Evans. Besides her wonderful relationship skills can you tell me what exactly does she teach that you have benefited from. Contrarily, I warn Christians to stay away from such a dangerous teacher. But you seem to believe that she is trustworthy. Interesting. Also you said that people could ask the same of my point. However, I have not denounced other approaches to tragedy, like you, in saying what would be my preference and the preference of some others. Finally, I do understand the point of your post that is why I responed. Furthermore, it seems obvious that much of what you have written is not grounded in the Bible or truly interested in dealing with real issues in an honest biblical way. Instead you resorted to fallacious argument against Piper. Interesting in the end, your only response to the second tweet is "I didn't see it." So are you definitely saying it wasn't there or are you saying you could have missed it? And if it was there does it change your position against Piper? I believe I can answer that question. The hubris that you have already shown in your comments do not give me much hope that you will recognize your error. I think that this is only the second time I've commented on your blog. The first time was during the controversy over the IMB policies. 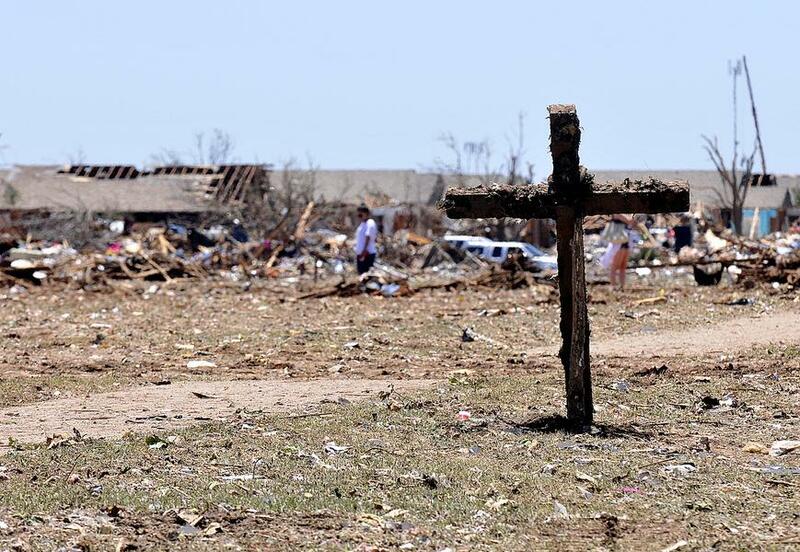 I am a pastor in Texas, but Moore, OK is my hometown and most of my family still lives there. I agree completely with you in identifying with those who are hurting; weeping with those who weep and rejoicing with those who rejoice. I find it ironic that Job's "comforters" were helpful so long as they remained silent. It was when they opened their mouths and attempted to explain Job's suffering that their errors began. I don't believe that John Piper meant to tweet something harmful, but neither do I believe that he understands how to reach out to people in times of tragedy evidenced by some of his other pronouncements following disasters. The anonymous poster above has not understood either. I believe in the inspired word of God, but not every verse is equally fitting or appropriate for every situation. Psalm 137:9 is also a part of the Bible, but I can think of very few instances, none in fact where it would be appropriate to post it as a message to someone without at least some commentary and context. Twitter probably isn't the best means of communicating difficult theological issues or for wrestling with theodicy. Many of my friends have lost homes, etc., but thankfully not their lives. A better tweet might be "Pray for the residents of Moore." Wade said his dad sent him the tweet in a text message, so it's probable that he never did see the second tweet. Having lived through the fearful activity of destructive cyclones (hurricane)and their aftermath,I applaud what you have written, and concur on every point with Kevin Everett. Your response to anonymous on this post is telling....seems to me you do not lead with love. He is obviously a brother in Christ yet you refused the right of fellowship by asking him to not call you brother. On the other hand you are silent when you are allow a a lady, who most in the SBC consider an unbelieving Roman Catholic, to denigrate the credibility of Douglas Wilson. What happened to the fellowship of the redeemed? BTW Christiane did you notice what appears to be a gun on Wades hip? Kevin Everett, you say that my words show that I do not understand, on the contrary, your words prove my point. You and others continually harp on the "opinion" that Piper's tweet did not fit the context or insensitive. Moreover, you then add your own self perceived right response. For you that response is "Pray for the residents of Moore." Now you have a right to feel that this is the better tweet but what you, Wade, and others do not understand is that because Piper chose to quote and tweet Bible verses does not mean his theology trumped love or that he is disconnected from people who have suffered loss. It is truly disappointing to see that you all do not understand this. Furthermore you state that Piper and me do not understand that certain verses although they are in the Bible does not mean they fit every situation. Well I can assure you that I understand this truth and I am sure Piper does also. However, you do not seem to understand that Piper's use of Scripture in this context is totally appropriate. Here is a quote from the NAC Commentary from Broadman & Holman on Job 1;20 "The tearing and the shaving are the expected reactions to the tragedies that suddenly and recently came to Job. The falling to the ground and worshiping are what separate him from others.36 He did not shake his fist skyward and scream, “Why me, Lord?” but bowed to the ground in humble acknowledgment of and capitulation to God’s sovereign will." Robert L. Alden, vol. 11, Job, The New American Commentary (Nashville: Broadman & Holman Publishers, 1993), 61-62. My point in quoting this commentary shows that Piper's understanding of this passage is perfectly consistent with other evangelicals and Baptists. In addition, I am sure many Arminians would also quote these verses in relation to suffering and tragedy. Yet your response in the end to Piper and myself, do not quote such a passages like Job 1;19-20 but just say "Pray for the residents of Moore." I would say to you Mr. Everett just realize that your remedy for addressing suffering and tragedy is not the only option. It is simply my preference to be called Wade - not "brother" Wade or even "Pastor" Wade, just Wade. That's what I always prefer. I appreciate anonymous comments. I'm not sure why he is so offended by what I have written, but I always am grateful for anyone who writes opposing views. Organized Christianity is way too cookie-cutter for my tastes. We need Christians who think for themselves, and I appreciate Mr. Anonymous opposition to my post. "Your response in the end to Piper and myself, do not quote such a passages like Job 1;19-20 but just say "Pray for the residents of Moore." I would say to you Mr. Everett just realize that your remedy for addressing suffering and tragedy is not the only option." I agree with you. Kevin's response "Pray for the residents of Moore" is NOT the only option for responses. Both you and Piper have shown another possible response. My point is that your response does no good IN THE MOMENT. We don't disagree theologically - we disagree in timing. This bothers me: demonstrate that I care so that I can share my theology. Maybe I give a cup of cold water and I know what it means because I have been given a cup of cold water, too. Wade, I appreciate your clarification on referring to you as brother. I will say that I am glad that we do agree theologically. However, I still do not see why you maintain that "your response does no good IN THE MOMENT." Wade, I believe it would be safe to say that my or Piper's response may not do good for some IN THE MOMENT. The same way I could say that "Our prayers and hearts go out to the families of Moore," does no good for some IN THE MOMENT. Still some may find comfort from these words. Remember, Wade I am not pleading how effective Piper's or anyones words or actions are in the midst of tragedy. But I am pleading for the loving liberty to try to offer what we can to those who are hurting without feeling like we are unkind or insensitive because we may approach a tragedy differently although yet biblically. Thank you for your time and comments. I am of the opinion that your words DO HARM, ACTIVE HARM, rather than good. Why? I am involved with ministry to women (and a few men) who have been sexually abused (similar to the physical abuse of a violent tornado, except their is an evil person who can be blamed for the sexual abuse). I believe that ultimately God is sovereign over evil- meaning (as my grandfather's friend A.W. Pink used to write) "Since God always works all things for good to those who have been called according to His purpose, if He cannot ultimately orchestrate good from evil He will either prevent it or prohibit it, for He always promotes good. So it can be said that God either prohibits, permits, or promotes all things." However, for the message of sovereignty that comforts only hurts those WHO HAVE EXPERIENCED THE ABUSE. Why? Because they have not yet processed how God can be in control of evil but not the author of it. Therefore, it is my contention that in the midst of pain, agony, tragedy and abuse, you don't connect someone with theological truth until you connect with that someone through emotional comfort. We still may disagree with methodology, but I think it is important enough of a difference to write about it. "“There, peeping among the cloud-wrack above a dark tor high up in the mountains, Sam saw a white star twinkle for a while. Sam asks "Is everything sad going to come untrue? What's happened to the world?" "A great Shadow has departed," said Gandalf"
"Hope is an orientation of the spirit, an orientation of the heart; it transcends the world that is immediately experienced, and is anchored somewhere beyond its horizons . . . It is not the conviction that something will turn out well, but the certainty that something makes sense, regardless of how it turns out." Wade, thank you for these timely posts. I greatly appreciate your messages of love and action and find comfort in them even now. My family lost our home to Hurricane Ike while I was in college. The church I was attending at the time would not let me talk about my experiences and did not support my family at all beyond finding a Bible in the lost and found to replace the one my brother had lost. They were too busy making sure I had the "correct theology" to see the overwhelming pain. All I wanted was for someone, anyone, to see just how alone I was and to hug me. I needed to hear that I wasn't alone and that I was still loved. You said "they have not yet processed how God can be in control of evil but not the author of it. Therefore, it is my contention that in the midst of pain, agony, tragedy and abuse, you don't connect someone with theological truth until you connect with that someone through emotional comfort." That is exactly what I needed to happen at my church. It took me about 6 months to be ready for the theological conversations. I first had to be able to talk about my experiences and remain in control of my emotions. I don't know if anyone else has said this, so I will. Thank you for your commitment to loving each person as an individual. Hi Wade, Nice article! I am making a big assumption here, but unlike most people that have commented on John Piper, the Moore tornado, and Piper's tweets, I HAVE met John Piper and even prayed with him once following a service at his church while I lived in Minneapolis (I attended Bethlehem Baptist church for a while). I found him to be very compassionate. That being said, I too along with many others was dismayed at his choice of scripture in his tweets. I too posted over at RHE's website and used some very strongly worded...um...words directed towards him and others who feel like they have to "pontificate" in troubling circumstances. I don't find Piper to be a monster, and, although I am an avowed non-Calvinist, I don't necessarily find his theology monsterous either. But I do appreciate your outlining of the need to see the victims as PEOPLE, and not cities. I wrote this with things like your post addresses in mind. it's from the "For what it's worth" department. So many Christians are angry using words that hurt. These are not un-graced people but graced ones who revert. Becoming what they once were before He sought them out. At least that's what it seems by people standing about. I've wondered what could be missing in so many today. In Christians who with angry words keep others at bay. It isn't a knowledge of the text of holy scripture at all. Chapter and verse are well remembered with precise recall. But something is missing and as I've pondered what it is, I'm thinking it may be the tears that were in eyes like His. When He saw Jerusalem and her failure in receiving Truth. Like a mother hen rejected He had tears with His reproof. Or as he was the day He came to the tomb of a friend. Disbelieving they accused Him of not caring at the end. He bowed his head and with tears flowing he prayed. He did not leave in anger but rather He stayed giving aid. Their understanding in the moment was not His concern. The Father seen in Him was that for which He did yearn. So perhaps Christ-likeness has more to do with tears than we think. If that's true then oh how foolish we are from tears to shrink. Father break our pride and our hearts so we can love each other. And may tears be a part of what makes us one with another. I don't typically comment on your blog, mostly I just read and think about what I've read. I've never met John Piper, and I choose to believe that he is a compassionate man that loves God and teaches the Word, based on what I have heard about him. I have sat under the teaching of some very solid, "well-known" ,(in some circles), theologians, who also love God and His Word. I certainly believe that God is the holy, righteous judge that does all of His holy will. It seems to me ,though, that we who have been believers for a long time feel we have to have some smart, snappy answer for everything that God permits, promotes or prohibits. In times of great sorrow in my own life, which can't compare to the suffering in Moore right now, the "gospel" that spoke loudest to me was the acts and words that reminded me of the kindness of God Himself. The person who took care of my dog when my dad died...the "sisters" who cleaned up my house when we had to leave suddenly, or just sat with me and let me cry when my brother committed suicide. They didn't shoot off Bible verses or their own interpretation of what the Bible says...and there is a place for that, in time. But mostly, what I've observed, is that people need time to absorb what has happened to them, to some extent, and they need to see the kindness of God in action, and sometimes that might be comforting silence from a person nearby. I believe that God can draw a person to Himself in those times ,too, just as He does through the teaching of His Word. Anyway, just a few of my own thoughts. I work with kindergarteners, so things are pretty simple down at our end of the hall. The older I get the more I want to be the little child Jesus draws on His lap, because apart from His wisdom and love, life would be totally overwhelming. Thanks for listening. Very thoughtful comment Paula with some outstanding points to ponder. Thank you for commenting. A very moving poem. I love how the truth comes across without judgment toward others who may be missing the truth. Poetry has a way to make that happen! That's the one regret I sometimes have with what I write. It SOUNDS like I am against persons, but in reality, I'm just against actions. The poem sums up my feelings precisely. Well, we'll just have to see what you write through a different lens then. That's because I see what you write as the epitome of what I'm trying to say in that poem. Let me clarify. what you write is the epitome of what I'm advocating FOR in that poem. Wade, I really appreciate your blog. This article is saying what I have been thinking for a long time. Thank you! Good and gracious words from you both. Very good response. Seems that some folks like to put the cart before the horse. It will work, to some degree, but it is not effective as the horse first and then the cart.